Consider a very elite, global club which controls financial systems around the world. Membership is limited and exclusive. The elite members are capable of bankrupting nations, or helping them come out of bankruptcy. How do you become a member of such a club? Where do the members gravitate normally? And even within the club, how do you move up the strict hierarchy? 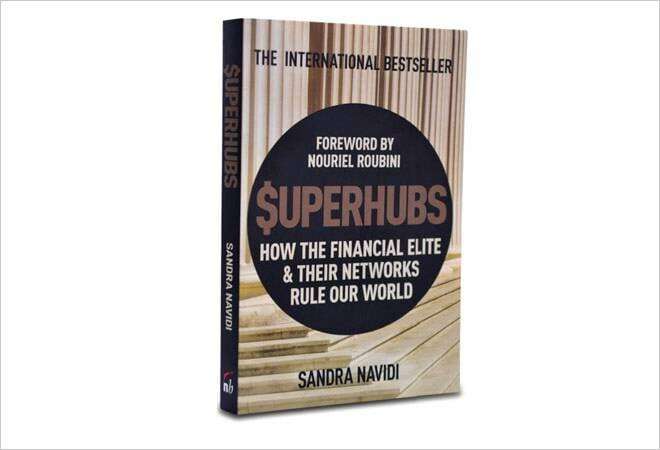 Sandra Navidi's book, $uperHubs: How the Financial Elite & Their Networks Rule Our World, is a close examination of the most exclusive global club of all - the financial elite's club. You need to be very rich to be a part of this club, of course. Almost all members in the top echelon are billionaires. George Soros (net worth $24.9 billion), who can move currency and other financial markets, is one of the members. David Tepper of Appaloose Management (net worth $11.4 billion); Steve Cohen, Founder of SAC Capital, now renamed Point72 Asset Management ($12.7 billion); John Paulson, Founder of Paulson & Co ($9.8 billion); Stephen Schwarzman, Co-founder of Blackstone ($9.5 billion); Leon Black of Apollo Global ($4.6 billion); and Henry Kravis (KKR, $4.2 billion) are some of the other members. They are hedge fund managers, bond kings, private equity titans, and currency market moghuls. But having billions (or at least millions) is not enough to get an entry. In fact, one of the pre-requisites of becoming a part of the Superhubs and the networks around it is being truly intelligent, at least in global finance. Most members are self-made multimillionaires and billionaires, bank CEOs (Jamie Dimon, CEO, JP Morgan Chase; Lloyd Blankfein, CEO, Goldman Sachs; Michael Corbat, Citigroup CEO, etc), or globally renowned economists (Nouriel Roubini, Robert Shiller, Paul Krugman, Nissim Taleb, and Thomas Piketty), politicians from the western world (Tony Blair, the Clintons), central bankers of the western world, chiefs of the IMF and World Bank, US Treasury Secretary, or others who have reached the top of their professions and fields. There are, in fact, relatively few inheritors who inhabit the Superhubs. The ability to take enormous risks and come out ahead often distinguish the members from others who are otherwise good financial brains, but don't make the cut. Navidi's book came after four years of research on networks that the financial elites form, how some of the biggest financial titans become Superhubs, which in turn attract other financial giants, and how networking - in Davos, in million-dollar charity galas and art auctions, in New York parties and other think-tanks and global conferences - keeps members closely linked to each other. The Superhubs like Davos or the charity galas of New York or the parties in the houses of some of the billionaire financiers provide the meeting ground for the elite. The money, information and social capital of the members of the networks provide infinite opportunities. Navidi is a member of the network herself. She is the founder and CEO of BeyondGlobal, a management consulting firm. She has worked with Nouriel Roubini closely at his macroeconomic firm, been an investment banker and a corporate lawyer and consultant. She also spends a good part of her life networking around the world with the subjects featured in her book. She examines the Davos phenomenon and points to its real importance. "The official purpose of Davos is to foster critical discussions to find solutions for pressing global problems... But the real reason why heavy hitters spare no effort or expense to attend? The endless peer-to-peer power-networking opportunities..."
Where Navidi's book scores over others who have written about financial networks and their power is that her's is an intimate look from the inside. And it is completely balanced. While it applauds and glorifies many of the men who control the financial levers of the world, she indicates to the inherent instability of the global financial networks and their ruthlessness. She points out that the networks are less about institutions and systems and more about super intelligent personalities, with their enormous egos, and their eccentricities. She also finds out the fact that at the global level, the financial networks are about rich white men - and excludes women to a large extent. (Christine Legarde is an honourable exception). Navidi tells how once a person gets into a network it is rare to fall out of it. But it does happens occasionally. Dominique Strauss-Kahn, who was once right at the top of the networks, is one example. Today he is scrabbling around the peripheries. Larry Summers made some spectacular mistakes - but managed to bounce back. And the one network king, who was spectacularly disgraced but has clawed his way right into the heart of the network is Micheal Milken, the erstwhile Junk Bond King. Navidi's book is both fascinating and frightening. Fascinating because it deals with high finance and the titans of the financial world and gives an intimate look into their working styles and their lifestyles, and frightening because it leaves you with an understanding of how fragile the global financial network is, and how dependent it is on human frailties - and why, even if it is running perfectly normally now, it can crash once again and vaporise billions and even trillions of dollars of wealth.